After school, he was ranching in South Africa from 1899-1902 (at the height of the Boer War). He then moved to Guernsey where he was a fruit grower until 1916. In 1908 he married Mary Stewart. She had already been widowed twice; he was her third husband. Her second husband was also an Old Radleian, TNF Davenport. The couple had one son of their own, and Frederick was stepfather to the four sons from Mary’s previous marriages. Her eldest son, Cecil Draper, was also killed in WW1. Frederick’s death meant that Mary was widowed three times before she was 45. 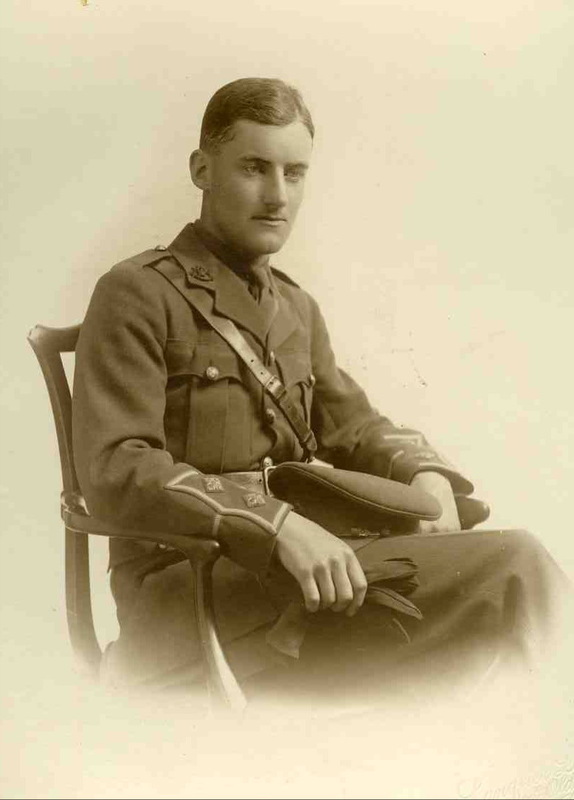 All the younger boys and Frederick’s step-grandsons, were awarded War Memorial Scholarships to enable them to attend Radley. Frederick Wells and Cecil Draper are the only father and son to both be recorded on Radley’s WW1 War Memorial. Posted in Commemorating the Fallen of WW1 and tagged F Social, Flanders & France (Western Front), illness, Lieutenant, pneumonia/Spanish flu on 7 November, 2018 by archives602. The van der Becke brothers from Antwerp, Belgium came to E Social in September 1914. They returned home in April 1915 and disappear from all Radley records. Posted in Countdown to Peace on 6 November, 2018 by archives602. Reginald Blackburn, E Social 1902. Lt, 9th Bn, Bedfordshire Regt. Died of pneumonia contracted on active service. After school, he went to Exeter College, Oxford. He was a Lloyds Underwriter. In 1912 he married Hazel Coghlan. He died in hospital at Brocton in Staffordshire from pneumonia contracted on active service. Posted in Commemorating the Fallen of WW1 and tagged E Social, Flanders & France (Western Front), illness, Lieutenant, pneumonia/Spanish flu on 5 November, 2018 by archives602. Maintaining normal school routines must have been very difficult during the War. Staff from all areas joined up or were conscripted, leaving the operational side very short-handed, while the teaching staff were replaced by much older, retired teachers or academics from Oxford who had never taught young boys at all. Parents struggled to find fees, with their own staff or fathers at the Front and rising inflation. 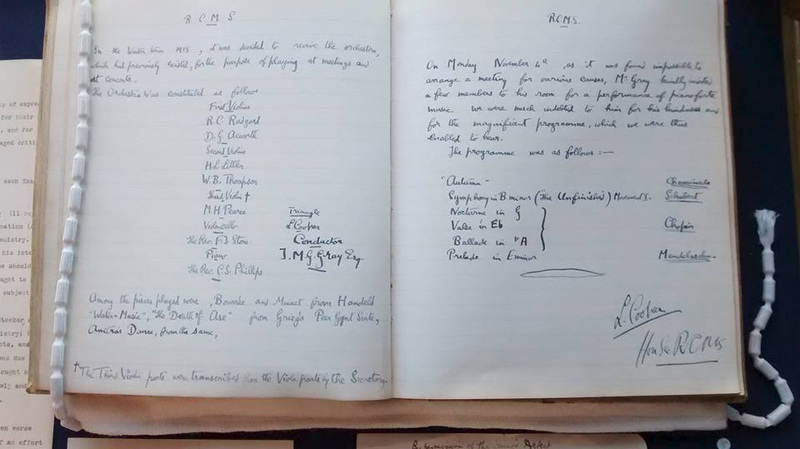 Today we feature: Radley College Revenue Account for the year ending 31 December 1915. 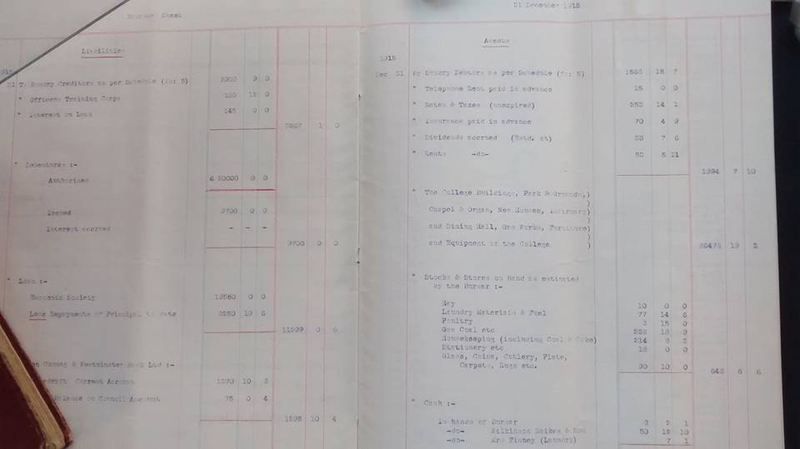 The accounts list many boys whose fees were in arrears. Note the new technology: the College now has a telephone, typewriters and a gas works. Posted in Countdown to Peace on 5 November, 2018 by archives602. Posted in Countdown to Peace on 4 November, 2018 by archives602. 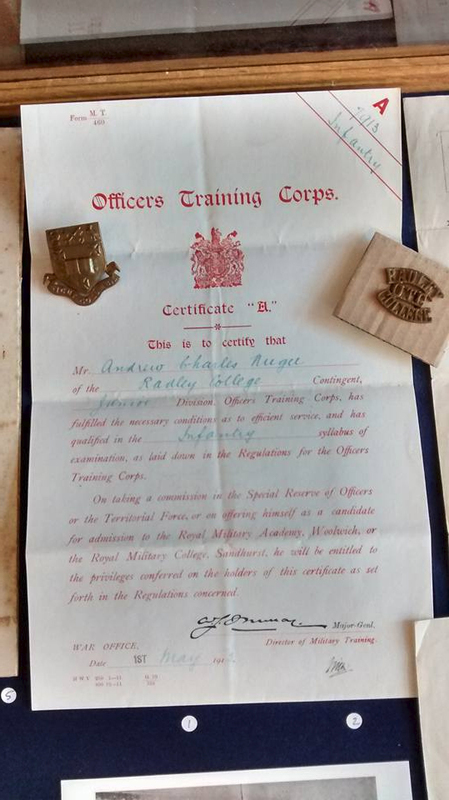 Today we feature: Radley College Officers’ Training Corps (now CCF) Certificate A. Awarded to Andrew Nugee 1 May 2012. Cert A was a fast track to officer training that allowed young officer cadets to proceed straight to commissions in Kitchener’s New Army in 1914. Posted in Countdown to Peace on 3 November, 2018 by archives602. Andrew Nugee Andrew was severely wounded in the fierce fighting following the Germans’ first use of liquid fire flamethrowers at Hooge, within one week of reaching the Front. In 1921 he took Holy Orders and served as a vicar for the rest of his life, including as Chaplain to St Dunstan’s Hostel for servicemen blinded in WW1. 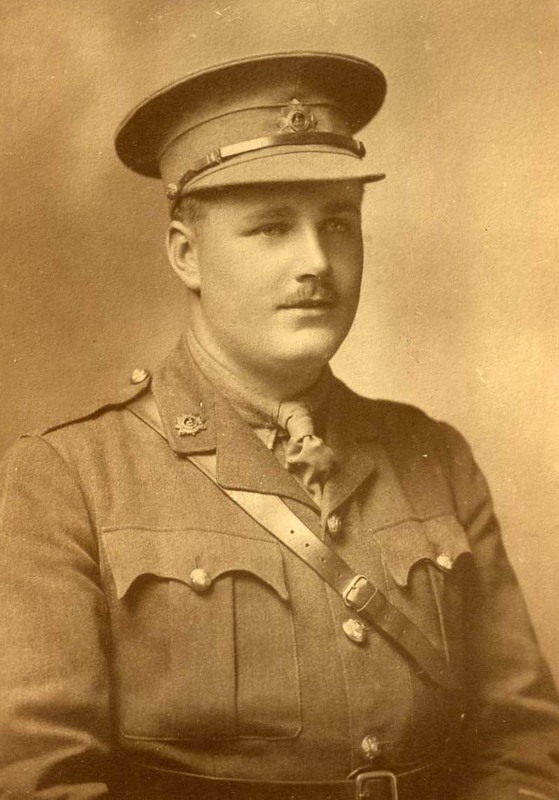 Today we feature: Appointment as a 2nd Lieutenant in the New Army, 2 November 1914. 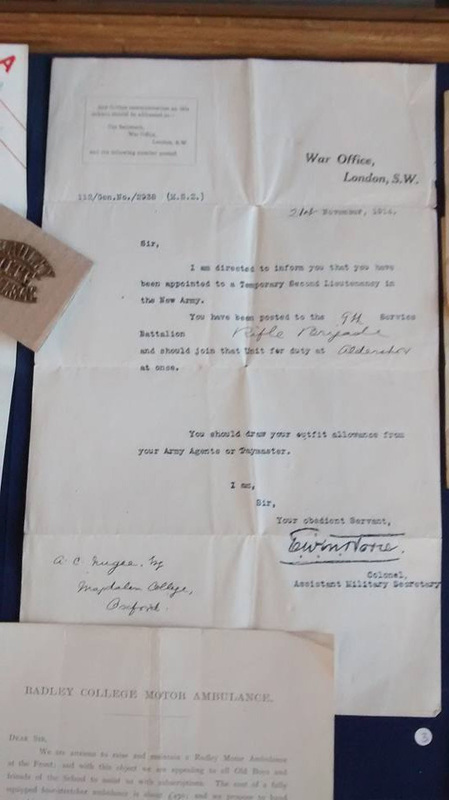 Addressed to Magdalen College, Oxford, where he had just taken up residence as an undergraduate. Posted in Countdown to Peace on 2 November, 2018 by archives602. Senior Prefect. He was a Junior Scholar who played for the Cricket and Rugby teams. 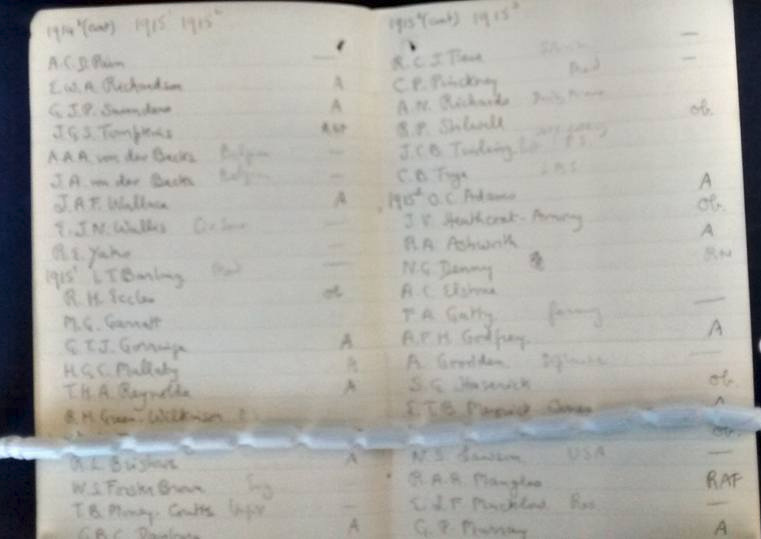 He won a History Exhibition to New College, Oxford in 1915, but joined up in 1916. He was a very popular Senior Prefect. News of his death on the major Feast Day of the school was devastating. After his death, his family published a novel entitled ‘Young England’ about school-life which he had written under the name ‘Douglas Strong’. Born in 1898, he came, here as a Scholar in 1912, and ended his School career as Senior Prefect – a position which he filled with dignity and conscientious thoroughness. He was a keen and successful athlete, who had no idea of allowing athleticism to interfere with the more real and important aspects of education. And indeed, all through his School life, there seemed to be a background of serious sincerity which guided his conduct and was the secret of his strong and quiet influence for good. And when we read the letter which told of his cheerful devotion and unshrinking bravery during those last trying and strenuous weeks of his service, we knew that he had been consistent to the end – the same gentle cheery boy upheld by that mysterious background of strength which had been with him all through. We are told how on one occasion he swam alone across a river and single-handed rushed an enemy machine-gun which was blocking the advance of his Company – no braver deed has been done in the war. Posted in Commemorating the Fallen of WW1 and tagged Battle of Valenciennes, C Social, cricketer, Flanders & France (Western Front), killed in action, Lieutenant, Military Cross, scholar, Senior Prefect/ Head Boy on 1 November, 2018 by archives602. 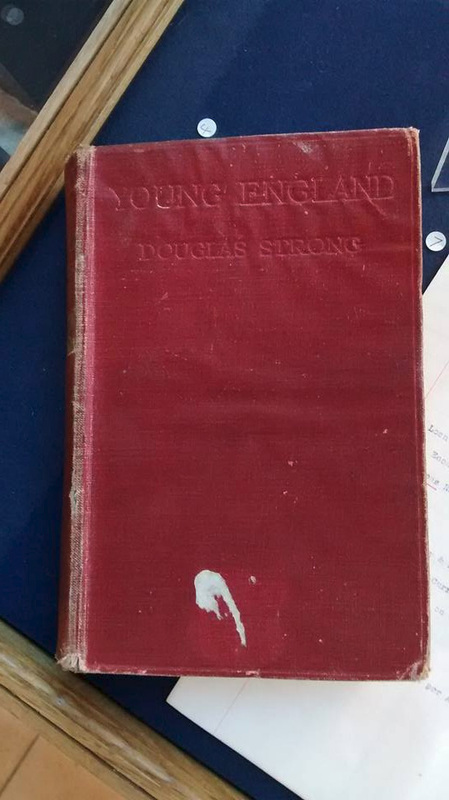 Today we feature: ‘Young England’ by ‘Douglas Strong’, published posthumously 1919. Desmond Cancellor (C 1912) became Senior Prefect in 1916. He wrote ‘Young England’ whilst convalescing from wounds received in 1917. 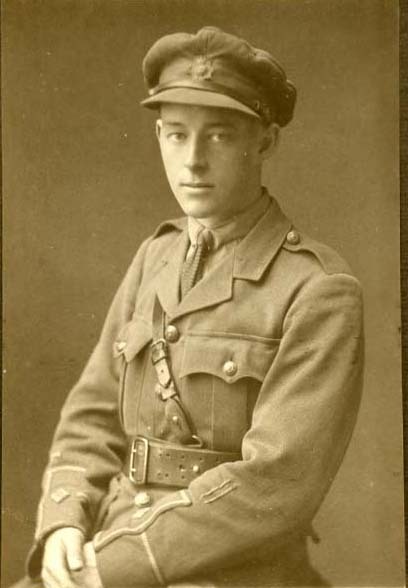 He returned to the Front in October 1918, won the Military Cross and was killed one week later on 1 November 1918. Posted in Countdown to Peace on 1 November, 2018 by archives602. He died in England and is buried at Brookwood Military Cemetery. Posted in Commemorating the Fallen of WW1 and tagged 2nd Battle of Cambrai, career serviceman, cricketer, died of wounds, Flanders & France (Western Front), H Social, Lieutenant, Sandhurst on 31 October, 2018 by archives602.